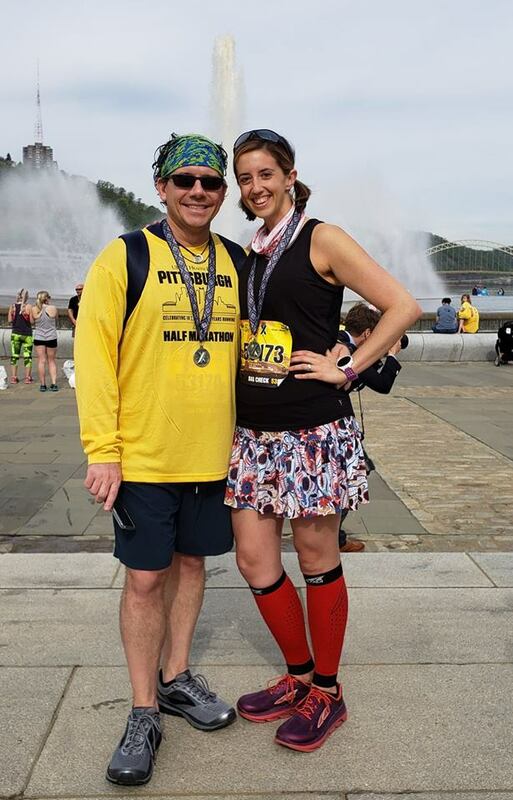 Earlier this month, I ran the 5k during the Pittsburgh Marathon Weekend as part one of the Steel Challenge: complete the 5k on Saturday and any race on Sunday (half, full, or relay) and earn extra bling for being a runner of steel. 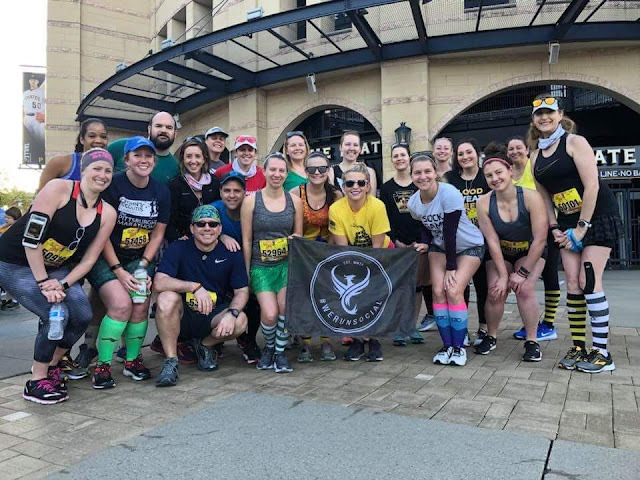 Flat runner for a 3.1 mile journey through Pittsburgh. 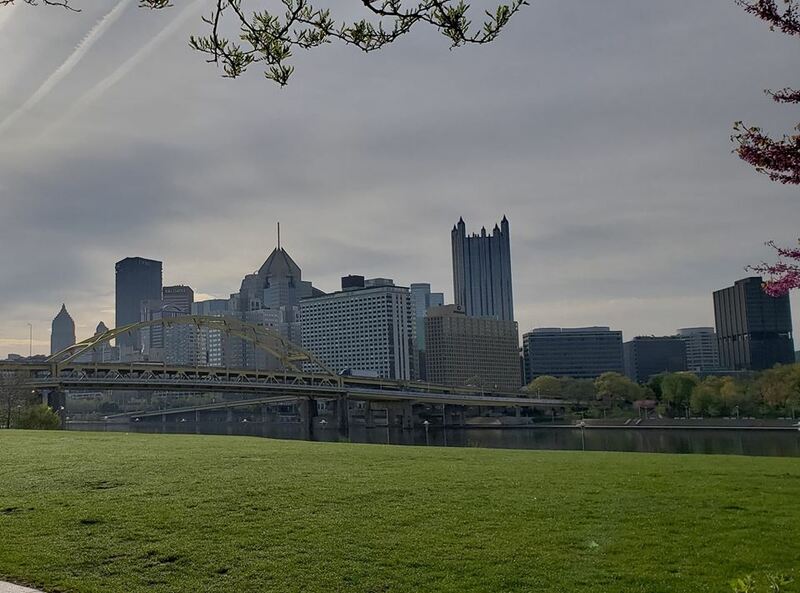 Saturday morning in Pittsburgh brought high humidity but cool temperatures- it made for an absolutely gorgeous sky. Running + friends = best day ever. As the race start time (8 AM) got closer, Matthew and I decided to make a port-o-potty run. We headed towards the bathrooms (and the starting corrals) like we've done for each of the other four years we've run this race and we realized something- the starting line was going in the complete opposite direction as we thought it would be! This year the marathon was celebrating its 10th year and (I guess?) in celebration of a decade of running, the 5k course was 100% backward from what it's been the last four years we've done it. 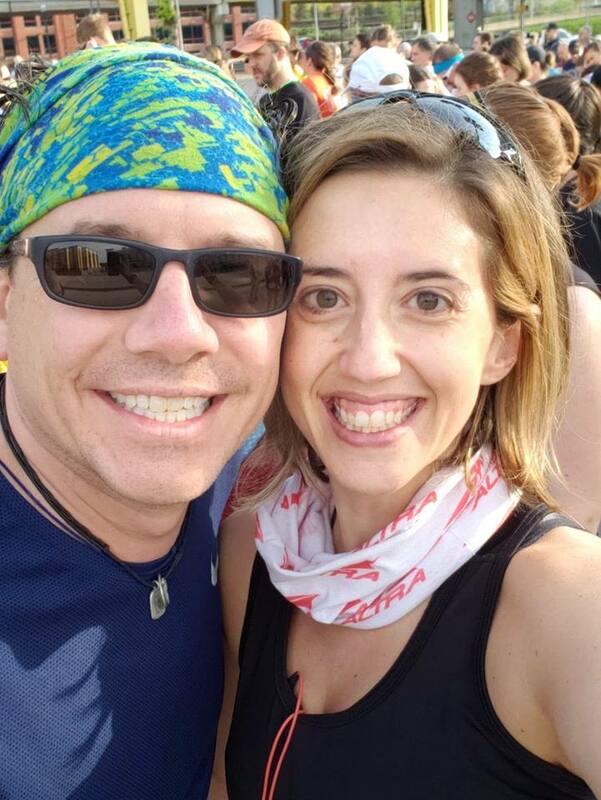 So, we were standing in the port-o-potty line that was actually at the very front of the race instead of in the very back of the race. Luckily for us, the line went quickly and we had enough time to pee and then walk all the way to the starting corrals. Matthew and I decided to run this race separately as he wanted to run for time. I dropped him off in the middle of the pack with the rest of our ohana, grabbed a quick selfie, and then made my way towards the back of the pack to start. Do we look ready to race? Because we totally are. Just after 8 AM, I crossed the start line and began my 5k route through the city. Basically, this course was the exact opposite of the course in years past. I actually really liked not quite knowing where I was going- it makes the race more unpredictable and exciting for me! The course featured the same sweeping views of the city as it always had, just from another angle. There were also fewer bridges this year; I believe we only crossed one due to some construction in the downtown area blocking the other bridges. Regardless, I loved the new course. Does it get much better than this? I also quite literally ran into friends Lauren and Chelsea towards the end of the race. I was able to grab a few photos of them before crossing the bridge and heading to the finish line. Love seeing friendly faces on the course. I gave one last final push to finish the race and crossed the line in 33:53, average pace of 10:32 minutes per mile. For once, I actually negative split appropriately! 11:08/10:46/10:14 splits. I felt really good after the race and was proud of the fact that I had a race strategy and executed it well. Though I had no specific time goal, I did want to have negative splits and an overall pace under 11:30- done and done. After collecting my medal and bottle of water and meeting up with Matthew and our running ohana, we headed through the Finisher's Festival and down to Point State Park to relax a bit before heading back to Steff and Joe's house- our awesome friends who always host us for Pittsburgh Marathon Weekend. I'm a sucker for a good fountain. With the half marathon the next day, we spend the rest of Saturday hanging out and then had a low-key dinner at Steff and Joe's with new and old friends. 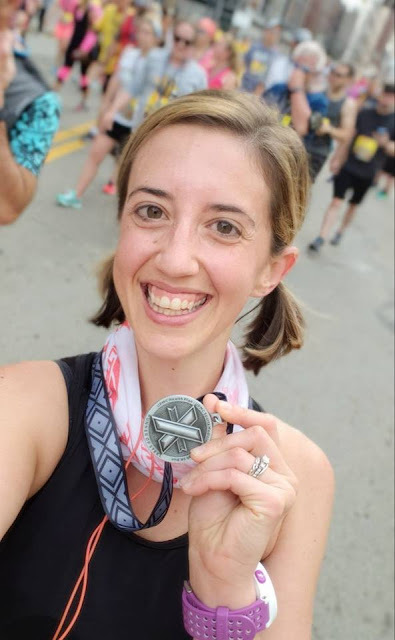 I really enjoyed the new 5k course this year and loved having a fun way to shake out my legs before the second part of the Steel Challenge- a 13.1 mile journey through the meanest hills of Pittsburgh. 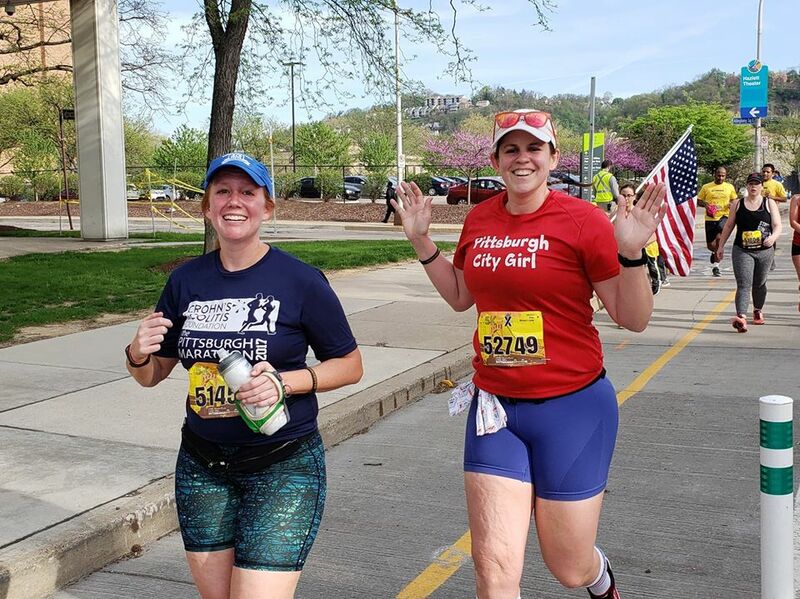 This race is definitely a great addition to Pittsburgh Marathon Weekend- if you're ever in Pittsburgh during the first weekend in May, this is one not to be missed! 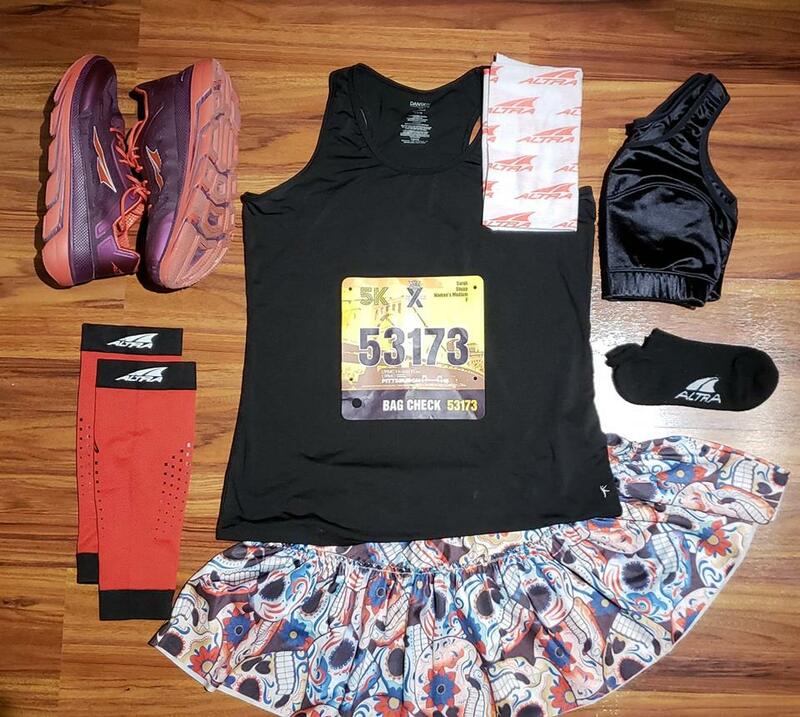 What's one of your favorite 5k races?